Three guides, trying to figure out if it was time for stripers yet. 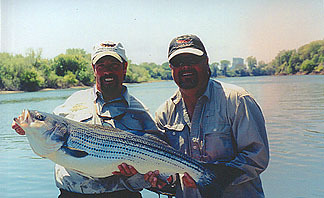 I was inspired by DanBlanton's superb slide show, so I called my guide friend Mike Bias to ask if the stripers were in. He said he didn't know but let's find out. So the next day we were on the American River at 7:00a.m. We dumped our shuttle at the confluence of the American and Sacramento, noticing a long line of power boats. It appeared they were fishing stripers. We ran to Howe Street and launched. The flow was about 2200cfs, clarity about 4', water temp 54 deg, air 48 deg. The conditions were too cold for stripers. Mike and I were casting 8 weight, fast sinking lines, 1/0 Clousers at 50 to 70 foot casts. 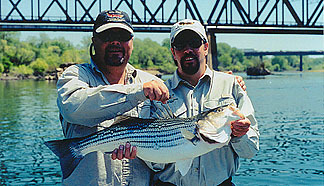 The stripers like the dark green water so we concentrated on those areas. Four and a half hours went by and no fish. Here come the excuses - water's too cold, wrong flies, fish are not in yet, therein, the flow, who knows, lets' eat lunch. After lunch, 12 noon, we started peeling clothing. It was getting warm, maybe 70 deg. We rowed back upstream to go over one of the better striper holes on the river. The hole was about 200 hundred yards long, and halfway down, WHACK!, a hard hitting take. The next immediate thing to do was clear the line; it was going out fast. This was a 15lb fish; it might run about 50 to 70 feet, so be ready. We came to the conclusion that the temperature had warmed up and the bite was on. Moving down river we passed up two nice holes being fished by other boats that were not having any luck, probably because they were not fly fishing. We moved on downstream and dropped into the honey hole of all honey holes. The bite was really on. I broke off on several fish and had to stop and catch my breath. We retied, rowed back to the top of this 300 hundred yard long pool, and started casting. The results: boated 1-12lb, 2-15lb, and 1-30lb. I'm glad we didn't give up, and kept slinging line. 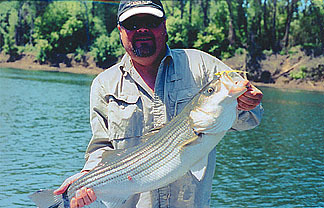 The stripers are a worthy adversary. Casting is key, so make sure you practice. Call me for more information at. 650-525-0908.